Directed by Sarah Gavron. Produced by Alison Owen and Faye Ward. Written by Abi Morgan. Release date: October 23, 2015. If you've seen the trailer for Suffragette, you can probably figure out two things. 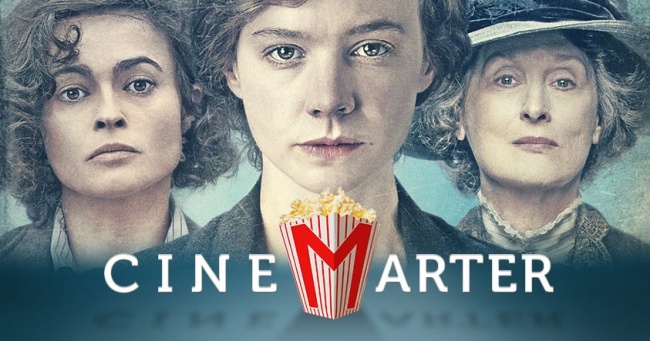 The first is that the movie is about the movement in the late 1800s and early 1900s whose goal was to give women the right to vote. The second is that this is the movie for which Meryl Streep will get her yearly required Oscar nomination. While the former is most certainly true - that is almost all the film is about - the latter may not. Streep, despite featuring rather heavily in the advertising, is only in the film for about five minutes. If she happens to get an Oscar nomination for the role, where she is good but on-screen for an all-too-brief time, it will be a joke. The movie surrounding her cameo follows Maud (Carey Mulligan), a woman in her mid-20s who works at the local laundry factory. She's married to Sonny (Ben Whishaw), with whom she has a child, and she works for long hours and for substantially less money than men at the same locale. She also deals with sexual harassment and a husband that controls everything. However, she's relatively content with her existence, until she becomes unwittingly involved in the suffragette movement of the time. At first she's in the wrong place at the wrong time, then she befriends the wrong people, and then she becomes a full-on feminist crusader, leading the charge against the oppressive government. What's that Ron Burgundy quote? "Well, that escalated quickly." The women she befriends are: Edith (Helena Bonham Carter), Emily (Natalie Press), and Violet (Anne-Marie Duff), among other less important individuals. Of these four, only Emily is a real person, and she's been included because of a sacrifice she made for the cause that caused at least one individual in the cinema to let out a massive gasp. What's more shocking are some of the things that Suffragette shows us, as well as how easy it is to relate them to the present day. Despite its events taking place somewhere around a century ago, Suffragette feels incredibly relevant to where we, as a society, currently sit. Suffragette is showcasing an important event in human history. It's a shame that the actual story it's telling - that of an at-first unwilling participant rising to the top of the movement in the course of what feels like just a few weeks - comes across as a touch pedestrian and very slow. Perhaps it's because the film is so focused on the fight for a woman's right to vote that it forgot to have interesting characters. They're defined solely based on their opinion of the core issue and as such come across as one-dimensional beings. Watching them suffer for rights we currently take for granted works for a while, but eventually we find out that's all the film has to offer. Well, that and wonderful set designs and costuming, as almost all British period pieces have to offer.